Welcome to Issue 6 of SHAPE Journal. In the midst of a seemingly impregnable self-confidence amongst the physicists and their cosomologist colleagues (concerning their currently held theories of both the sub atomic realm and the Big Bang), there looms a Sword of Damocles hanging over them in the shape of the possible failure of the Large Hadron Collider, and the recent discovery of Supernovae where they shouldn't ought to be. These two could precipitate the biggest crisis in these areas for almost a century. No Higg's Boson at the LHC will not only pull the rug from under the mathematical theories of the sub atomic region, but along with those nuisance supernovae, could demolish much of the consensus on Cosomology too. 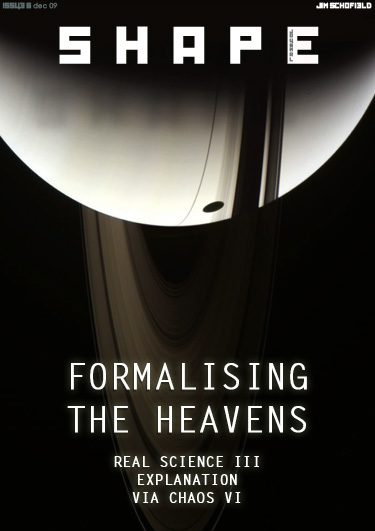 In this issue and those immediately following, we have therefore included the article Formalising The Heavens which relates the problem of these troublesome findings, and the theorists' rather desperate proposed solutions. See what you make of it! In the next issue we shall be starting an important series of papers on the extension of the Theory of Natural Selection beyond Living Things, to be applicable to Reality in general. This is crucial because it also includes a linking of the vital Events in all developments termed Emergences to both areas mentioned above and the Evolution of Life on Earth.